In this article, I’ll show you how to write an effective white paper that gets your company noticed and the pitfalls to avoid if you’re new to this area. Define your target audience. Once you have defined your audience, you can begin to tailor your material to reflect their needs. It’s very important to stress this point. Many novice writers – especially those with a technical background – will focus on the low-level aspects of the software or technology. Avoid getting stuck in the details. Though this has its place, it’s probably not here. Executives, and those in the management level, are your target readers. So, write with them in mind. Next, determine the main topic for your white paper. This may sound obvious but many writers overlook this and ramble from one vaguely related subject to the next. Keep to one topic per paper. Avoid the temptation to discuss other features, functionality and innovations. Stay focused. Establish you as the definitive authority on the subject in question, i.e. that you stand head-and-shoulders above the competition in this area. Create awareness of a new market trends and/or product offerings. Demonstrate how you are uniquely qualified to achieve this objective. Ensure that decision-makers select your product over competitors by providing them with persuasive arguments and backing up with trustworthy references. Tone – it ensures that the tone of the document doesn’t change, especially if several people are involved in writing the paper. Format – it serves as the definitive source for questions about formatting, (for example, whether or not to put a full stop at the end of a bullet list) and reduces squabbles amongst team members. Guidelines – it also helps new writers and others contributing to the document to find answers to common questions. Having a style guide reduces interruptions to your schedule and gives direction to other team members. Make sure to balance the amount of text in the document, for example 2000 words, with images. While it’s important to include as much information as possible, you can improve the readability of the white paper by adding useful images, charts and tables. These also help break up large blocks of text and encourage the reader to focus on the key points you want to highlight. Introduction – this opening section covers the high-level issues and trends in the industry that you are involved with. It may also include recommendations or conclusions you have made about the topic. High Level Solution – this describes the relevant technologies at a high-level, especially those you have designed and intend to promote. Support your arguments with tables, charts, and graphics. All of these add weight to your argument and provide a contrast to the main text. Solution Details – this explains how the service, technology, or business model works. This is the heart of the white paper. It provides very detailed descriptions of the proposed solution. You can also use tables, charts, and graphics for this section, with cross-references to external supporting documents if required. Business Benefits – This discusses the return on investments, usability, and adherence to standards. Customer quotes are always very helpful. It demonstrates that you are an authority in your field and can back it up with these endorsements. Don’t take references for granted – not all your competitors will be able to supply such endorsements. Summary – close the paper with a concise summary of your main points. As many readers will skip the entire document and read this section only, summarize the main selling points about your solution here. Here’s a suggestion: write the summary as if it were an entirely standalone document. Distil it into one page and conclude with the most important point that you want the reader to remember. If this section is compelling enough, you might persuade them to go back and read the entire document. 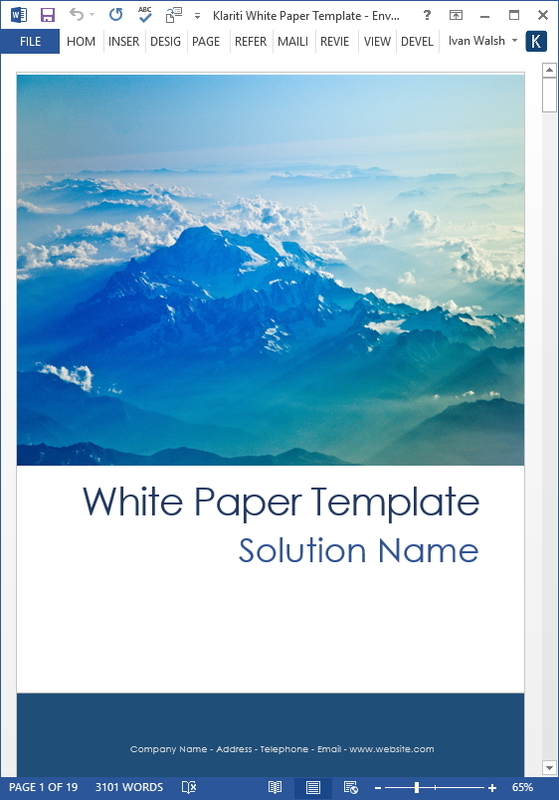 Finally, remember that your white paper is a sales document; it’s not a technical guide. Once you have finished it, leave it aside for a few days. Then go back and read it. Ask yourself: would I buy this solution? If not, don’t be too hard on yourself as it takes time to write a persuasive white paper. Instead, identify the areas you feel are weak and strengthen these. Soon, you’ll have a nice, sharp document that you can share with your clients.